I love this tapestry. 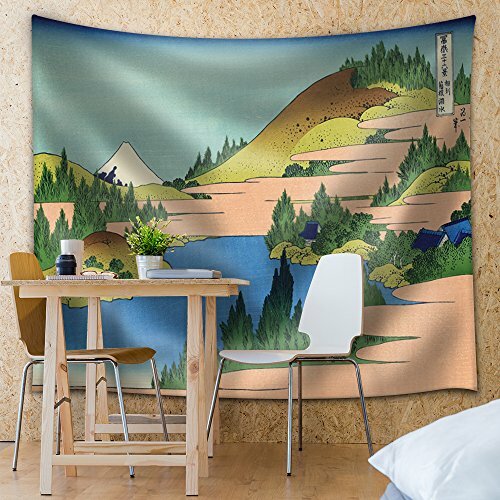 I also ordered the Red Fuji tapestry. I highly recommend this tapestry. Beautiful! Bought it for my husband for Christmas since it's one of his favorite painting and it's exactly as it looks in the photos. It's a nice silky material and looks great. Hung it up in our living room! This tapestry is so amazing. I changed my whole room up and I had a blank wall that needed something to fill in this empty void. Luckily, i found this tapestry and I can personally say that it made my room 100 times better. Would recommend if you love this art and need a tapestry for your room! Got this as a gift for a friend and it was really big. Even the medium. It looks just like the picture!! This thing is gigantic! It fits perfectly in my nautical themed living room. It is well made and doesn't look cheesy at all (which is what I was worried about). Would recommend would buy again! Beautiful art. Beautiful fabric. Does not tear, scratch, or create little thread fluffs. It is not the FULL "Great Wave" painting -- but rather a well cropped version of it. This does not ruin the art itself, for the Great Wave is still the most powerful thing on my room wall. It is my favorite thing to stare at and let my mind go. I enjoy it every day--hanging on the wall.